Weekends only Apr 20, 21, 27 & 28 from 11am to 3pm .... Starting May 3 open Friday through Tuesday each week from 9am to 4pm. Spring has finally arrived in Turtle Valley and our donkeys are anxious for us to open the Refuge to our wonderful visitors. We are pleased to announce that the Refuge will be open for the last two weekends in April ….. the 20th and 21st (Easter Weekend) and the 27th and 28th from 11am to 3pm. Starting May 3rd we will be open from 9am to 4pm 5 days per week from Friday through Tuesday only. WE ARE CLOSED ON WEDNESDAYS AND THURSDAYS AND ASK FOR YOUR COOPERATION AS THESE TWO DAYS ARE SET ASIDE FOR IMPORTANT ROUTINE ANIMAL HEALTH CARE AND FARRIER SERVICES AS WELL AS GROUNDS CARE. Did you know the lilies from our annual spring lily sale are featured in gardens throughout interior BC and will soon be seen in Tuktoyaktuk? This year as we invite everyone to the Refuge for our 7th Annual Exotic Lily Sale we thought it might interest you to know where these lilies come from and how this wonderful annual fundraising event started. One of our Directors, Chris Harris was an accountant in Alberta in another life and one of her favorite clients (and now long-time friend) was a very special lady named Marilyn Cardinal. 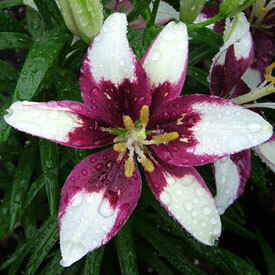 Marilyn owns Sweetgrass Farms which specializes in researching, procuring and growing Asiatic and Oriental Lilies. When Chris and her husband Tom moved to BC in 2009 that friendship continued and through Chris’ stories, Marilyn came to know about the Refuge, its 4-legged residents and why Chris is so passionate about the charity and its mission. She wanted to help and asked if she could give Chris a few lily bulbs to grow and sell in the Spring of 2013. Fast forward to 2019. This year’s order for lilies is over 500 bulbs, 400 which were presold as bulbs (thank you so much Shannon Garrison) and 100 that Chris will be planting in early April and “birthing” as she calls it to be sold at the May 12th fundraising event. The lilies that Marilyn and Chris choose each year are not only extraordinarily beautiful but are well suited to our environment and climate. This year’s offerings include a few favorites from previous years plus new varieties that will either spark your joy of lilies or complement your lily garden. Special thanks to Marilyn for donating these bulbs each year. You are a true champion of the donkeys and we appreciate you. Join us at the Refuge on Sunday May 12th, Mother’s Day from 9am to 4pm. Purchase your lilies, enjoy a cup of coffee or tea and delicious desserts from recipes in our brand new Green Pastures Cookbook (which will be for sale in our Donkey Shoppe). Don’t forget to spend time with the donkeys – they will be excited to know you are coming! It is going to be a wonderful day! 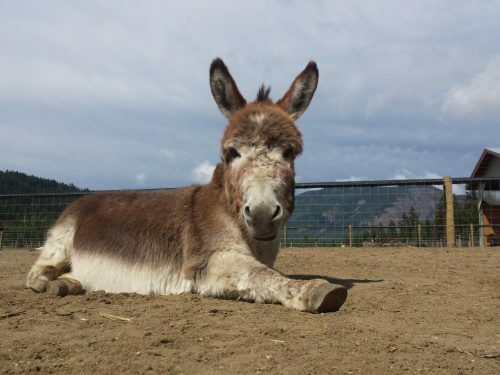 As always the proceeds from this fundraiser will go toward the rescue and ongoing care of our very special donkeys.